These producers are creating small-quantity, vineyard-designated Zinfandel bottlings that reflect their sites and the unique California terroir. Only a winemaker with a deep independent streak and an intentional avoidance of marketplace realities would devote their career to Zinfandel. The vines are difficult to manage, the wine is challenging to make and sales are perennially lukewarm, except among a small, dedicated following of Zin lovers. Yet, such winemakers do exist, and the world is better because of them. The best Zin masters turn the fruit of gnarled old vines into bold, nuanced and expressive wines. Zinfandel is known as California’s heritage variety. While it appears to have originated in what’s now Croatia, the grape came to the state in the mid 1840s. Production began to surge after the 1849 Gold Rush, well before the now-common French varieties were popular. It grew well in the Mediterranean climate and made good-quality wine in various styles, from sparkling and dessert wines to red and rosé still selections. Zin was the “darling of the California wine industry in the 1880s,” says wine historian and author Charles L. Sullivan. It was the most widely planted red grape in the state as late as 1998, when Cabernet Sauvig­non replaced it atop the list. Its lineage and widespread plantings account for the many small patches of old vines today. The vines survive in spite of Zinfandel’s notoriously uneven ripening habits, susceptibility to mildew and bunch rot, and only moderate color and tannin components. Grown in the right places, it has an exuberant berry-like, briary and spicy flavor profile that can be irresistible. At Saucelito Canyon, crafting nuanced Zinfandel isn’t much different today than it was when founder Bill Greenough made wine nearly 40 years ago. Bill found the remote property surrounded by mountains behind Arroyo Grande in 1974. It was home to forgotten Zinfandel vines planted by English homesteader Henry Ditmas in 1880. Just three acres, it had been San Luis Obispo’s County’s first commercial vineyard. But the vines were abandoned around Prohibition. Upon discovering the plot, Bill began to bring the head-pruned, dry-farmed vineyard back to life slowly. His first releases, red and white Zinfandel, were from the 1982 vintage, and he sold them from the trunk of his car. Those restored acres still form the core of Saucelito Canyon’s estate program, which produces about 5,000 cases a year across 18 different bottlings, mostly Zinfandel varietal wines or blends. The wines offer bright acidity and a high skin-to-juice ratio, as the old clones don’t produce very heavy clusters or big grapes. The Greenoughs enhance complexity by staggering picking times from early on through later in the season. He believes Tom is more adventurous in the cellar, where he cold-soaks some lots—“that used to scare me to death,” says Bill—and puts others through open-top barrel fermentation. With Zinfandel, ripeness can vary among grapes in the same cluster, so the biggest challenge is determining the grape’s sugar content at harvest. Taking on the challenge does have its reward. Saucelito Canyon continues to make fans with its Zinfandel. Shebl is director of winemaking and general manager of Renwood Winery, one of the biggest and best Zinfandel producers in Amador County and the Sierra Foothills. He’s a strategic winemaker who’s not shy about using French oak barrels, adding a particular yeast strain that enhances a wine’s glycerol or even reducing alcohol through membrane filtration when he thinks it’s necessary. But he gives the credit for Renwood’s impressive Zinfandels to Amador County’s shallow soils, relatively high elevation and the warm days tempered by cool evening breezes that come down from the Sierra Mountains. Shebl started at Renwood in 1999 as a cellar worker and rose to assistant winemaker. He left in 2009 to start his own winery, Fiddletown Cellars, which also produces outstanding Zinfandels from individual sites. Ultimately, however, he would return to Renwood in 2013—it’s as if his career has come full circle. Shebl’s Renwood wines are firm in tannins and fairly big at 14.5% alcohol, but that’s wimpy compared to some of his neighbors that register 15% and higher. The differences in the sites show through, with Riker Vineyard displaying boisterous blackberry character and Story Vineyard laden with seductive lilac aroma. “I am lucky enough to be able to make them the way I like to drink them,” he says. “We get more of a finesse-driven style by picking sites that have the weight, but [we’re] going for the sweet-sour balance in the wine. I like it when a wine starts ‘sweet’ and soft, but has some acidity behind it.” —J.G. If you visit Grande Vineyard along the Silverado Trail with Biale, you might be invited into Dorothy Rossi’s house for fresh-baked cookies. Her family has farmed this piece of land since 1920, still tending to many of the original vines. Grande is one of the knockout single-­vineyard designates made by Biale and his team at Robert Biale Vineyards. Such unique, long-standing parcels are the stuff that Biale’s Zinfandel dreams are made of. 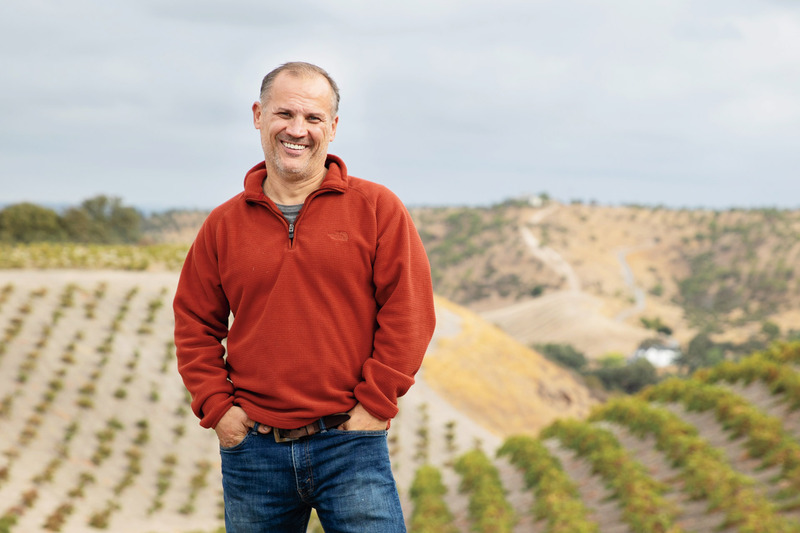 The familial vineyard and his father’s persistence in producing Zinfandel was an inspiration to Biale when he founded Robert Biale Vineyards in 1991 with childhood friend and fellow Napa native, Dave Pramuk. Biale works with dozens of historic Zinfandel and mixed-blacks sites across Napa Valley and Sonoma, on which he applies more Burgundian winemaking techniques. In 2013, Biale hired Trester “Tres” Goetting, another Napa native, to help craft the wines. Aldo’s and Grande are two of the crown jewels in Biale’s portfolio. The winery also makes Zinfandel from the Falleri Vineyard in Calistoga, a living relic of California’s field-blend era, farmed by members of the Falleri family since the 1920s. Other notable sites in Biale’s lineup include the Old Kraft Vineyard west of St. Helena that dates to the 1890s, one of the oldest vineyards in California; R.W. Moore Vineyard in Coombsville, originally planted to Zinfandel in 1905; and the Varozza Vineyard in St. Helena, which has been farmed by the Varozza family since 1913. Limerick Lane is a historic brand and rambling estate vineyard largely devoted to Zinfandel, which is unusual for the Russian River Valley. Though the oldest producing part of the vineyard dates to 1910, Bilbro, a Sonoma County native who took over the property in 2011, is just its third owner. Bilbro’s wines show a real sense of place. They combine the power of a relatively warm knoll just south of Healdsburg with the cooling influence of the Russian River Valley appellation. This is rare dirt for Zin, a variety that remains popular and respected within Sonoma County, even as the area continues to evolve and refine its plentiful Pinot Noir and Chardonnay offerings. But Zinfandel’s history in Sonoma County is significant. The county has the second-most Zinfandel acreage after San Joaquin, with a little more than 5,000 acres planted. Zin vineyards that date back to pre-Prohibition dot the region, and some of the most important producers to put the grape on the map are based here. Limerick Lane’s Rocky Knoll Zinfandel has been our highest-scoring Sonoma County Zin for two vintages in a row (2013 and 2014). A dry-farmed, rocky outcropping of vines interspersed with Petite Sirah and Carignan, it’s full-bodied yet balanced and beautifully put together. His hands full with the winery and being a father to four kids, Bilbro has slowly begun passing the winemaking reins for Limerick Lane to superstar Chris Pittenger. Pittenger has been winemaker at Limerick Lane since July. He also makes the wines for his own brand, Gros Ventre Cellars, and was previously winemaker at Skinner Vineyards. —V.B. What’s more difficult to make: Napa Valley Cabernet Sauvignon or Sierra Foothills Zinfandel? Harvey, who’s crafted wines for almost 45 years, has made both more times than he can count. To him, the answer is easy. To make Zin, he contends, is not. Harvey took his first winemaking job at Montevina Winery in Amador County in 1974, and the next year did an official work-study winemaking apprenticeship in Germany. Returning to California, he spent the next two decades making Zinfandel and other wines for Story Winery, Santino Winery and Renwood Winery, also in the Sierra Foothills. In 1996, Harvey was recruited as partner, winemaker and president of Folie à Deux Winery in Napa. The winery was purchased out of foreclosure, and he was tasked with the mission to revive the operation. Harvey produced award-winning Cabernet Sauvignons from the winery’s Estate Vineyards in Napa Valley, but he also continued his passion for Amador Zin. He used the region’s best vineyard sites and relationships with local growers to produce exciting wines under the Folie à Deux brand. Eight years later, Harvey returned to Amador County to launch his brand, Scott Harvey Wines. He knows the intricacies and potential shortcomings of the grape well, but what he is concerned about is the challenge that wine lovers face when choosing a Zinfandel. His solution has been to place a graphic on the back label of Scott Harvey Zinfandel bottles. It depicts a style scale from left to right that ranges from New World to Old World, the latter end where Harvey places his winged dragon logo. It serves to show where his dry, non-oaky, complex and high-elevation wines stand. —J.G.